Today I am joining my Bento Bloggers & Friends on this Winter Wonderlunch themed bento hop. Please use the button at the end of this post to continue through the rest of this 13 blog hop. 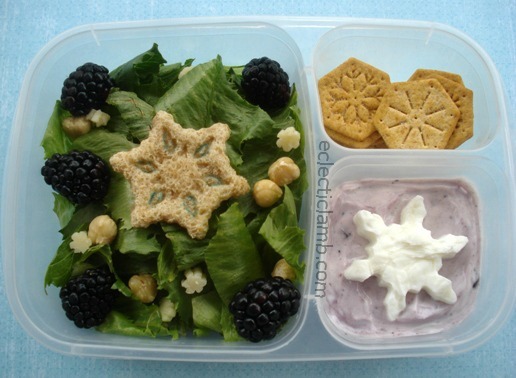 This snowflake themed lunch was simple but special and satisfying. Please click on the button below to see Venia’s creation at Organized Bites. This entry was posted in Bento / Cute Food, Food and tagged bento, hop, winter. Bookmark the permalink. Looks great! Love the frozen yoghurt snowflake! Totally making me hungry. What a beautiful snowflake salad! Love this lunch it is so elegant and fun! That was a fun Blog hop – lots of great snow flake ideas and uses. I like the contrast of yours against the dark salad. I also loved the broccoli Christmas tree in one of the hop’s Bentos! What an interesting looking salad! Do you find it fills you up well? I don’t normally pack salads for lunch but when I do, I include a decent amount of protein such as this one because protein helps me feel full longer. I had Greek yogurt, nuts, and cheese in this lunch. Looks so yummy! You can pack my lunch anyway! Looks yummy!! Love the yogurt snowflakes! Love the snowflakes, what a healthy & yummy lunch! That snowflake salad looks delicious! Love all the snowflakes in this lunch.